 4 Support Corners Telescopic Hook, firmly lock the phone to prevent shake, never fall.  One-way Prevent Back Gear + 4 Support Corners Telescopic Hook = 0% Drop Probability.  4 Support Corners Telescopic Hook, made of super toughness nylon. Don't worry about scratching the phone.  Support Substrate, made of ABS engineering plastic. It is sturdy and durable.  At the same time, give 2 sponge cushion . According to the thickness of cell phone, select one or several to combinate, then adhered it between the phone and the support substrate for shock absorption.  Easy Install: Nylon elastic fixed ring, suitable for all bicycle handles, easy to operate and easy to install.  Approx Size: 120 x 60 mm/ 4.73"x 2.37"
 Sturdy and Secure: The Bike Phone Mount clamp comes with 4 support corners to ensure your phone stays securely attached throughout your Bicycle.  Security Upgrade: Automatic Locking Cooperate with One-way Prevent Back Gear, prevent the occurrence of loose during strenuous exercise.  Easy Installation: Convenient tool-free installation makes it easy mount to any Bicycle Handlebar,only need to locate and lock nut.  Universal Compatibility: The Bicycle Phone Mount Holder for Bike works with virtually any iphone x 8/8Plus/7/7Plus/6s/6Plus/5S, Samsung Galaxy S5/S6/S7/S8, Google Nexus, LG, Huawei and more between 3.5 and 6.5 inches wide. 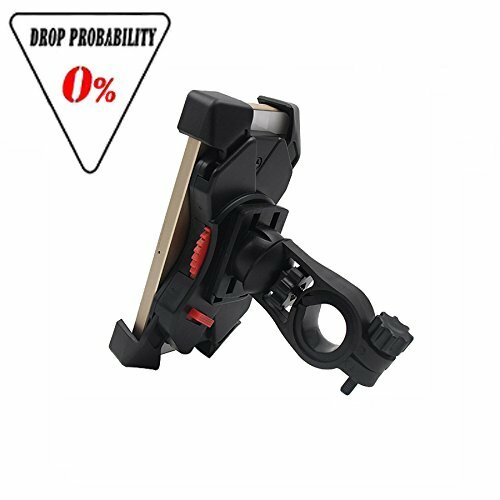  12 Months Guarantee: If you are not satisfied with This Bike Phone Mount Holder. Just contact us, 100% refund, no risk. If you have any questions about this product by Bisnuy, contact us by completing and submitting the form below. If you are looking for a specif part number, please include it with your message.